1976 saw the debut of the Comic Action Heroes, Mego was looking for a way to captilize on the success of the Worlds Greatest Superhero license. Mego decided that series of playsets and vehicles and “pocket sized” action figures ,would augment the license without as Neal Kublan put it “pirating sales from the core (8″ Superhero) business”. According to Mr Kublan, the line sold “Good, not great” but it should be made known that from it’s 1976 debut, Mego produced a 3 3/4″ Superhero line until it’s demise in 1982. The figures may seem crude by today’s standards but they were a pioneer for the licensed 3 3/4″ action figure explosion that happend in the late 70’s. Each figure was sat in a crouched position to enable the figure to fit into vehicles and stand on their own. The little blue catalog that appears in carded UK Comic Action Heroes figure has been a mystery to us at the Megomuseum for year. Not one that kept us up at night but a mystery none the less. Thanks to Museum member Clemso, we can finally see the crazy wonderful artwork up close. Comic Action Superman, 1st Version Wonder Woman, Joker. Comic Action Aquaman and Shazam. 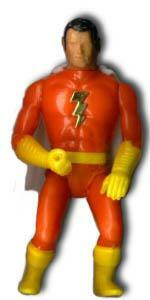 While crude in appearance, the Comic Action Heroes do show a great deal of innovation on Mego’s part. 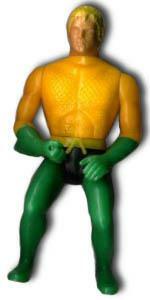 Each part was cast in one solid colour and then connected, gloves and arms on a character such as Aquaman are two pieces to save on using paint ops. The body style was reused for Mego’s 1977 CB McHaul line. but they have their own gallery…..